My great friend Frances is having a baby girl. The crazy thing is that she is due the day after my birthday. So I wanted to make sure that she had a great shower. 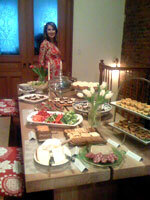 I designed the invites to match some of the items she is registered for and then did all of the delicious food. It was a great party. 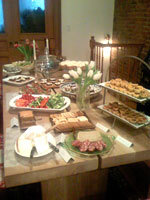 My treats combined with all of Frances’ beautiful service wear made for a really impressive table. Everything has sort of a French flair to it, for some reason in my mind all showers should be catered with French foods.